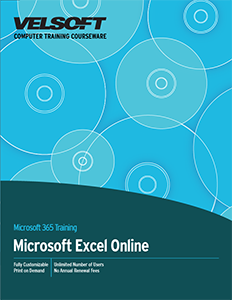 Seeing is Believing This sample manual to teach Microsoft Excel Online is in MS Word format. Excel Online is Microsoft’s cloud-based, easy-to-use spreadsheet program. Learn how to work with formulas and functions; format parts of a worksheet; use pictures, tables, charts, and PivotTables; and make a spreadsheet look professional with this course. Download a sample of this fully customizable computer training package now.